The build-up of tar and creosote in your chimney or stove, is often caused by burning the wrong fuel. If left, over time it can cause problems and at worst result in a chimney fire. By checking the moisture content of your fuel with a moisture meter and ensuring it is less than 20% moisture, helps prevent the build-up of tar and creosote. your annual chimney sweep if you regularly burn sold fuel. 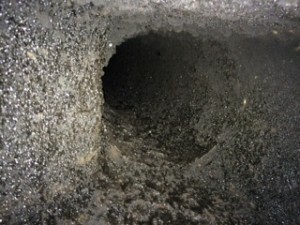 If this hasn’t been possible or you are worried about the condition of your chimney, we can check the flue for you. BOOK YOUR ANNUAL CHIMNEY SWEEP NOW ! Rid your chimney of any soot or tar that may have built-up over the winter. If creosote or tar is discovered and at a level that we would recommend the removal of with our cre-away treatment, we are offering all of our customers £50 OFF* Cre-away treatment. * £50 off all Cre-away treatments booked and carried out by 31st July 2017. Quote ‘UPAWAY50’ when booking.